This Prosecco Thank You Gift comes from a family owned vineyard who pride themselves on sustainable viticulture and the care they take in production pays dividends. 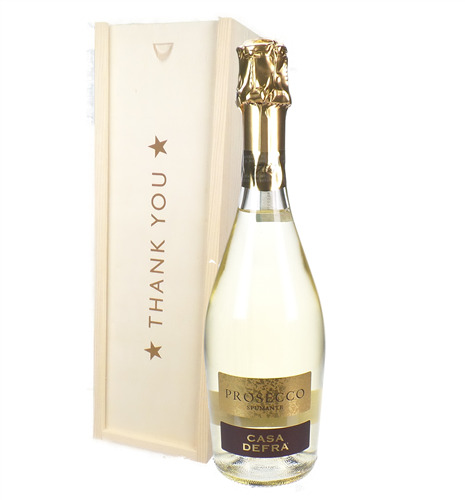 This is a lovely crisp Prosecco and the wine comes presented in one of our 'Thank You' branded wooden gift boxes so it really gets your message of Thanks across. 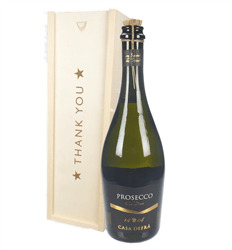 Needing to say a thank you - then our prosecco thank you gifts should hit the mark. Presented in a wooden thank you gift box, they look great and are all are delivered on a date you choose and come beautifully presented complete with your own personal gift message.